Jacques Cousteau called it the "aquarium of the world" for its 950 fish species and diverse shorelines. 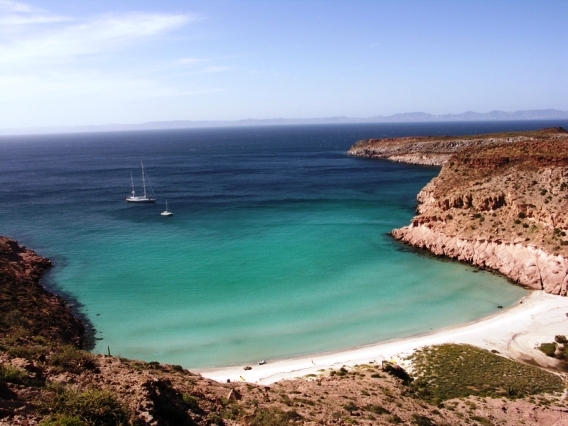 You could say that the Sea of Cortez is like a thumbnail version of the oceanic kingdom, even more than only a thumbnail, for it supports 80% of Mexico's fishing and supplies 90% of its shrimp catch. Geographically convenient to the planet's hungriest markets (including white sharks hunting pinnipeds) -- Japan, China and America -- the Sea of Cortez is now seeing massive loss of biomass, with a despondent fishing industry plundering both opportunity and the water for whatever can be found. From an August 2013 article in Harper's Magazine: "Fishermen working the sea's 26,000 boats are both rich and poor, newcomers and inheritors of thousands of years of tradition. ... 85% of its species either are being fished at their maximum or are over-exploited. Consequently, there is no better place on earth to look at the future of global fishing and the crisis facing the ocean." Read more here. Dyer Island, South Africa ... Striving for "unbiased research," biologist Mark Marks meets THE LEGEND -- those amazing great whites -- in the deep blue, and without a diving cage. Use of a rebreather (a device designed by the military that recycles exhaled air, removing CO2 and adding oxygen) enables him to be more like a creature of the water instead of making loud bubbles. Lots of commentary from public and professionals about sharks and Marks! It's hard to believe that a single movie (do we have to name it?) planted such deep, primal fear in so many people -- even little children who haven't seen it. The film left a permanent wake in which the whole world seems to be swirling.